The following is my translation of the life of communist operative Yan Chiang Ding who was arrested by the Lim Yew Hock government and during Operation Coldstore for his underground communist activities. The original article in Chinese can be accessed here. The website is a treasure trove for those interested in communist history of Singapore and Malaysia. Briefly, Comrade Yan was involved in May 13 Student Movement, Hock Lee Bus Riots when he was a student at Chinese High. He was later arrested under Operation Coldstore in 1963. Yan was released after 11 years in detention and joined the armed communist insurrection in Malayan jungle shortly after. In 1979, at 38 years old, Yan was killed in a fire fight after being ambushed in the Selangor forested area. Comrade Yan Chiang Ding was born in Singapore in 1941 into a poor family. His parents were employed by foreigners. At the age of 13, Yan took part in progressive student activities. In 1954, soon after he began his studies at the Chinese High School, he took part in the May 13 student movement, which opposed the National Service Ordinance passed by the British colonial government. When the Lim Yew Hock government attempted to change the Chinese school education system in 1955, Yan took part in student strikes and collective struggles in school to safeguard mother tongue education. On May 12 during the Hock Lee bus riots, he participated in activities to show support for the workers who went on strike. On 18 Sep 1956, the Lim Yew Hock government, under instruction from the colonial government, took action to suppress anti-colonial forces, arresting many anti-colonial patriots and shutting down numerous progressive unions and student groups such as the Singapore Factory and Shop Workers’ Union, Singapore Farmers’ Association and Singapore Chinese Middle School Students’ Union. People were discontented and this eventually resulted in large-scale strikes by students and workers in October that year. Yan played an active role in the student struggles and his performance was outstanding. In 1961, he was admitted to the Nanyang University (Nantah). During his varsity days, besides focusing on his course of study, he also participated actively in academic research and social surveys. For example, in 1962, he played an active role in the opinion poll of residents in Tanjong Pagar and Kreta Ayer which showed that the people were against the merger between Singapore and the Federation of Malaya that was proposed by the colonial government and reactionary forces. Yan took on the work of educating the masses in his free time. Besides giving lessons on culture and knowledge to village dwellers, he also hosted talks on current affairs and often worked until late at night. He was well-liked by classmates and village dwellers as he was diligent in his studies, responsible in work and brave in struggles. In 1955 when Yan was 14, he was detained for one week by the Lim Yew Hock government for safeguarding mother tongue education. However, he did not flinch and took greater strides towards the road of revolution. On 2 Feb 1963, the Internal Security Council which comprised reactionary forces from the colonial government, Kuala Lumpur and Singapore launched Operation Coldstore to shut down progressive unions that oppose the merger and arrest union leaders and patriotic people. Yan was again detained. Early that morning, agents from the Special Branch and policemen charged into Nantah to arrest the students. Yan remained calm and cleverly hid documents that could implicate his comrades while a search was conducted. Although he was eventually arrested, his composure and quick-wittedness ensured the safety of comrades and students. Yan and other comrades went on several hunger strikes when imprisoned, with the longest one lasting more than 140 days. One day, in a bid to extract a “confession” from Yan and another political detainee who was a paid union secretary, the reactionary authorities brought them from Changi Prison to the Central Police Station and put them in solitary confinement. During that time, Yan and the comrade were stripped of the freedom to move around and read books and publications. They were also interrogated and tortured round the clock by Special Branch agents. To protest against the unreasonable suppression by the reactionary authorities, they went on a hunger strike and were prepared to sacrifice their life to expose the ruthless means of the reactionary authorities. When the reactionary authorities saw that they were in critical condition, they became afraid that the hunger strike would arouse public opinion and cause condemnation which could adversely affect the reputation of the reactionary rulers. In the end, they acceded to Yan and the comrade’s request and sent them back to Changi Prison. During the hunger strike, Yan became unconscious on several occasions and almost lost his life. The reactionary authorities used all means, including threats and inducements to make Yan say things that were unfavourable to the people and write a “confession” against his belief. When Yan refused to do as told, he was given all kinds of torture, but that did not weaken his fighting spirit a bit. He reproduced articles from the Voice of Malayan Revolution and PRC radio stations and secretly circulated them among comrades who were detained. He remained firm and refused to accept the conditions for release put forward by the reactionary authorities. After 11 long years in prison, Yan was released in early 1974. After his release, he continued to secretly engage in revolutionary propaganda and helped to raise funds for the Communist Party of Malaya (CPM). He told comrades firmly that he was ready to go to jail again. He said that going to jail was just a temporary loss of freedom and that the walls of a prison would never be able to stop a real revolutionary. He also said that being tortured was nothing and only weaklings would succumb to it. 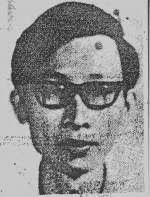 Under the arrangement of the underground party organisation, Yan joined the Malayan National Liberation Front a year later in 1975. He was responsible for organising and publishing work in the beginning and later went on to head the group in Selangor. In 1978, Yan fulfilled his long-time aspiration of joining the CPM. From then on, he set high standards for himself and devoted himself completely to revolutionary work. At the same time, the reactionary forces also tried to hunt him down. Later, the party organisation decided to deploy him to the troops for fear of his safety. In May 1979, Yan joined the 6th Assault Squad to fight for the independence and liberation of the motherland. On Aug 7 that year, when passing by a forested area in Selangor, he was ambushed and killed by the enemy. He was only 38. Whether he was working in the underground or deployed with the troops, Yan led a simple life and was a responsible and friendly person. He loved his comrades, he was decisive, had great fighting spirit, served the people wholeheartedly. He was loyal to the revolution and had profound hatred for the enemy. Comrade Yan has left us, but his gentle smile and good character will always remain in our heart. The comrades have vowed to avenge him and fight the revolutionary war to the end!